Place des Vosges in the Marais (Gallery II) is the oldest square in Paris, and it's a true square, 140 meters by 140 meters. It was built by Henri IV between 1605 and 1612 and became a model for residential squares in Europe. One thing that was particularly new about it was that all of the houses were built to the same design, with red-brick and stone facades and steeply pitched slate roofs with dormers. The square has had many famous residents, including Victor Hugo. Today its arcades contain popular restaurants, cafés and galleries. The square is beautifully landscaped with linden trees and on any nice afternoon is filled with children playing and older folks strolling or relaxing on the benches. 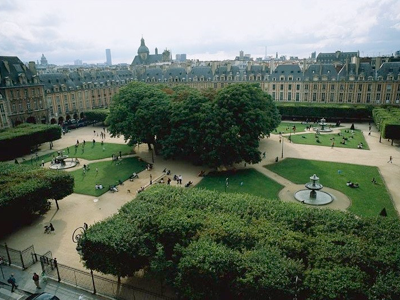 In a city full of lovely open spaces, Place des Vosges ranks with the best of them.